Who Am I Now? Finding the New Improved You After Divorce. Hear Cindy speak on Thursday, February 20, 2014 at 4:00 pm in her ongoing radio series on BlogRadio with Zurriane. For the last —- years you have been attached emotionally, mentally, spiritually and physically with another person. Now that person is not in your life in the same way (or at all). How do you claim back your identity? How do you move forward in a positive way? How do you answer the question: Who Am I Now? 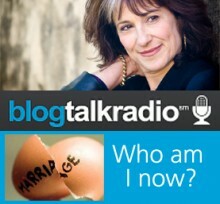 Click into the Program – Who am I now?